Attenberg is the newest film byAthina Rachel Tsangari, starring Ariane Labed, Giorgos Lanthimos, Vangelis Mourikis and Evangelia Randou. Marina (Ariane Labed) is 23, lives with her father Spyros (Vangelis Mourikis) with whom she shares a fascination for Attenborough nature documentaries and spends most of her time with her best friend Bella (Evangelia Randou). Unfortunately, Spyros is dying and Marina has a hard time coming to terms with that, while at the same time she finally makes the first attempts to explore her sexuality, mostly with an engineer (Giorgos Lanthimos) she’s the cab driver for. Attenberg was described as a musical without singing in the programme and I thought that sounded very nice and expected a lighthearted, up-beat little movie. Attenberg is neither of this things. Instead it’s mostly uncoordinated and pretty boring. Cyrus is the newest movie by Mark and Jay Duplass, starring John C. Reilly, Marisa Tomei, Jonah Hill and Catherine Keener. John (John C. Reilly) is in a depressed hole and has been there for quite a while. Maybe even since he split up with Jamie (Catherine Keener), who remains his friend. One night at a party, he meets Molly (Marisa Tomei). They hit it off right away and John falls in love. 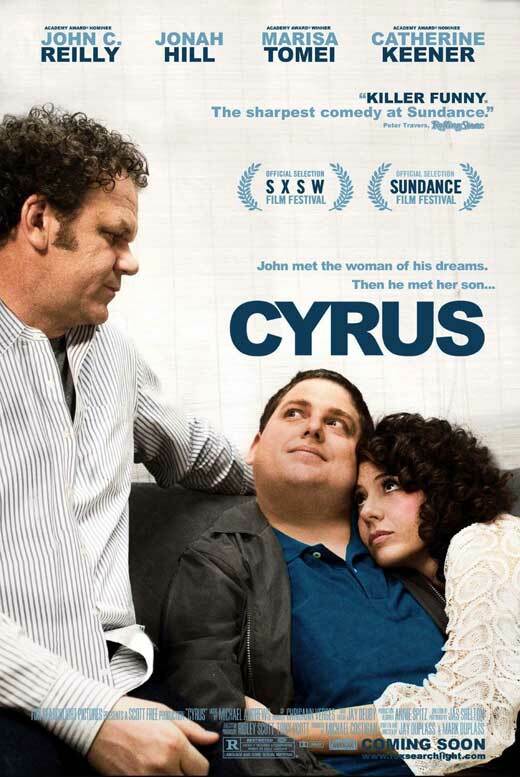 But Molly has a grown son, Cyrus (Jonah Hill) and neither Molly nor Cyrus seem to be able to let go of each other. There were quite a few things I appreciated about this film – foremost the acting, but also the way the characters talked to each other – but in the end, it remains yet another story about two guys fighting for the girl where the girl gets no say in the matter. That the two guys are not two lovers but the lover and the son makes hardly any difference. And there are way too many films about this already. 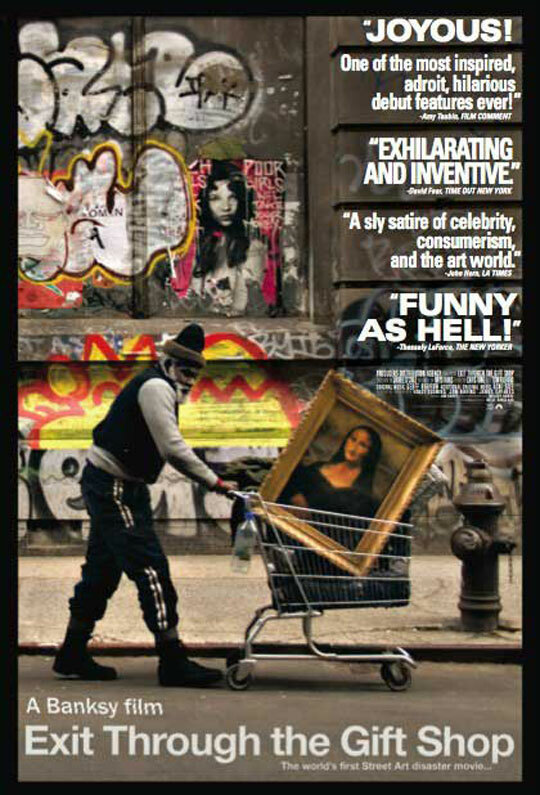 Exit Through the Gift Shop is Banksy‘s first film project. It’s a kind of documentary, narrated by Rhys Ifans and featuring Thierry Guetta, Shepard Fairey, Space Invader and many more street artists. Thierry Guetta is a French emigrant living in the US. He’s obsessed with filming everything and through his cousin – who happens to be Space Invader – gets into the street art scene. He starts meeting all the big street artists and follows them around for a while with his camera. And one day, he even gets in touch with Banksy. But Banksy finds Thierry the more intriguing subject of a film. I loved Exit Through the Gift Shop. 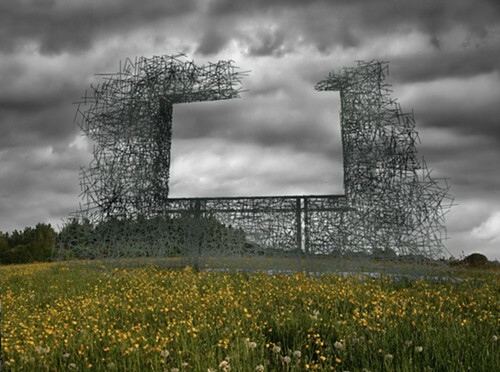 You get to see loads of good art, it’s totally funny, extremely intelligent and afterwards you can speculate with your friends about which parts of it are real. 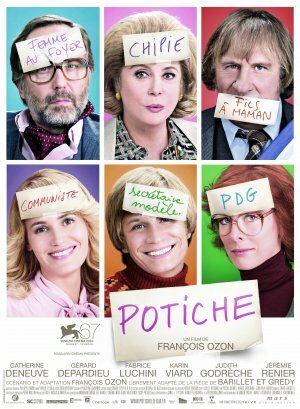 Potiche is the newest film by François Ozon, based on a play by Pierre Barillet and Jean-Pierre Gredy and starring Catherine Deneuve, Gérard Depardieu, Fabrice Luchini and Jérémie Renier. 1977: Suzanne (Catherine Deneuve) is practically the definition of a trophy wife. Married to Robert (Fabrice Luchini), who owns an umbrella factory, she spends her days with the household, writing bad poetry and getting visits from her grown kids. But when the workers at the umbrella factory start striking, it’s Suzanne who has to step in for her choleric husband. Potiche is an entertaining film with a good cast. Its feminist message is watered down quite a bit to make more room for comedy, but it nicely captured the feminist current of the time. Most of all, it’s light-hearted. A List of Scary Mangas. Mark Wahlberg the new Crow? Leslie, My Name Is Evil is the newest film by Reginald Harkema. It stars Kristen Hager, Gregory Smith*, Ryan Robbins, Kristin Adams, Kaniehtiio Horn, Anjelica Scannura, Sarah Gadon and Travis Milne. Leslie (Kristen Hager) is a good girl. She comes from an “L.A. suburb, my parents are divorced and now I’m searching for a new sense of purpose” [actual quote] and seems to find this with Charles Manson (Ryan Robbins) and his girls (Kaniehtiio Horn, Anjelica Scannura, Sarah Gadon). Which, as we all know, doesn’t end too well. Perry (Gregory Smith) is a good boy. He has good grades in school, a promising career in chemistry and a nice Christian girlfriend (Kristin Adams). 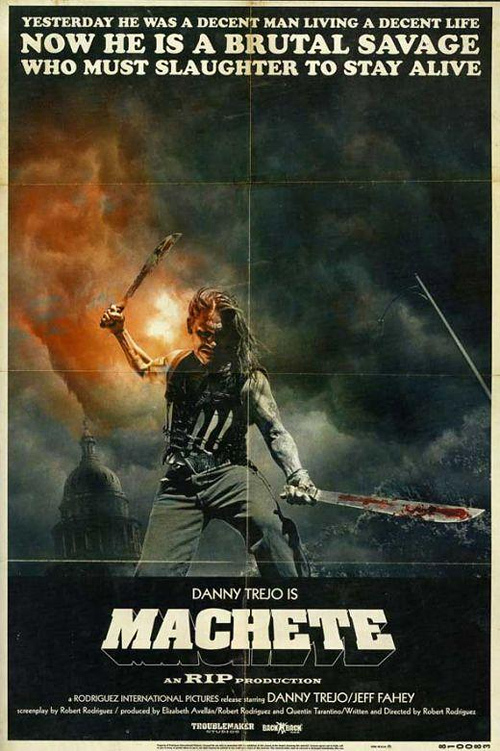 Everything seems to work perfectly, even though he dreads being drafted for the Vietnam war, until he gets called into the jury of the Manson trial and he falls in love with Leslie. Leslie, My Name Is Evil effectfully combines B-Movie style, gore, sarcasm, whimsy and humor to create an actually pretty thoughtful movie about violence. It’s one of the films you should go to movie festivals for because you probably wouldn’t see them otherwise. And you’d miss out on a lot.